It’s thirsty work running around on a ship! Victoria was nosing around the other day looking for something to drink. Where could she get some fresh water? It hadn’t rained recently so there were no puddles to drink at. She couldn’t drink the seawater as it was a long way down from the ship. Too salty anyway! Victoria had to hide as she saw the Chief Engineer and 1st Engineer coming by. They were talking about the machine she was just looking at. She heard them say that this machine makes fresh water out of seawater! She couldn’t believe it! How does that happen? The machine takes salt water from the sea and removes the salts and minerals from that water. It does that by boiling the seawater in a vacuum then cooling it. As the water heats and cools, it forms steam or condensation and that water becomes the drinking water. It runs that condensed water through particle filters, a UV sterilizer, then adds bromine to make it “potable” or drinkable. It comes out with no minerals or salts so it is like distilled water that the chemists use in the lab. On the JR there are 123 people who need lots of fresh water for drinking, cooking, showering, washing, laundry, toilets, and in the laboratories. Is that a lot of water to use? The average American uses 380 liters of water a day. On the JR every person uses an average of 361 liters of water every day. 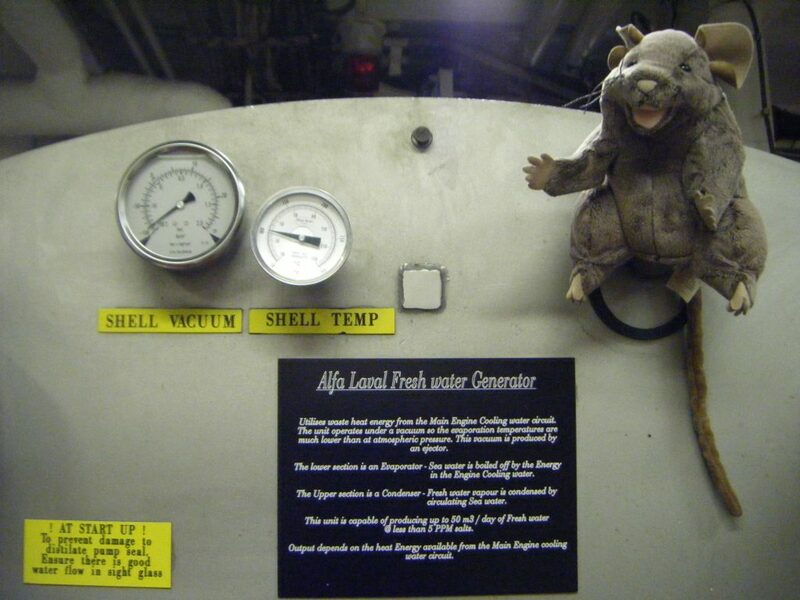 The Alfa Laval Desalinator makes about 44.5 metric tons of water on the ship every day, which is enough for everyone!